The Cork City Gamelan had to take a back seat for a week. Important other things were happening. First of all: The Reich Effect – a five day festival celebrating the 75th Birthday of Steve Reich, possibly the most influential music composer alive. 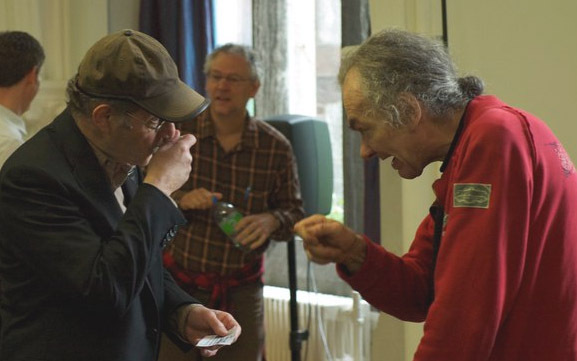 Reich himself was in town, directing performances and hosting a composition seminar, which I attended. I also went to see performances every night, among others the Kronos Quartet, Crash Ensemble and London Sinfonietta. I learned a lot during those five days, and I would have hardly been able to take in much more. Another Big Thing happened: As I arrived back at my studio after the seminar on Wednesday, my Waterphone, made for me by Richard Waters (the artist who invented it) himself, had arrived at the customs office. I cleared the import formalities, and on Friday Morning, I finally held the Thing Of Beauty in my hands. Kala’s Moment of Fame (3:45, 4.1 MB, in the iPod/iTunes MPEG4 format). By the way: I am not using the bow on this short section. Bowing the instrument really brings the harmonics and the sympathetic resonances to life. Kala is Niall’s giant Rottweiler puppy, probably a teenager in dog’s terms. She behaves like a typical spoiled and moody teenager, anyway. She insisted on being featured on the recording. The rhythm at the beginning is the noise of her collar while she scratches herself. The Waterphone is probably going to feature prominently as an additional instrument in some of the music I compose for the Cork City Gamelan. It is also going to get me back into performing live after many years of being “off the road” due to my disability. My first composition for the Waterphone, though, is going to be a tribute to Reich. I have already sketched out a possible basic concept. Feel free to use this music (and remix it) under the license terms outlined in the Disclaimers page. 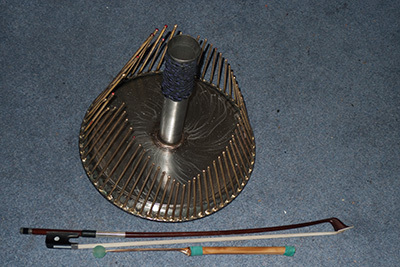 This entry was posted in Articles With Music For Downloading, Other Soundworks In Cork, Playing The Waterphone. Bookmark the permalink. One Response to The Reich Effect… and My Waterphone!